Down in the sewers, Raphael is battling a big mean robot. And Raph is furious. As he lays into the robot, his mind is elsewhere; he’s mad at Michelangelo. Apparently, during a fight, Mikey was teasing him and even said that he’s “got this” and took the lead. Raph couldn’t stand being taken down a peg by his brother and now he’s really, REALLY livid. But it goes deeper than that. He’s sick of Mikey’s attitude PERIOD. He’s sick of all the jokes, the goofing around, the insult comedy… all of it. The robot grabs Raph by the throat and puts a knife to his face, but by now Raph is SO mad at Mikey that he completely trashes the robot. 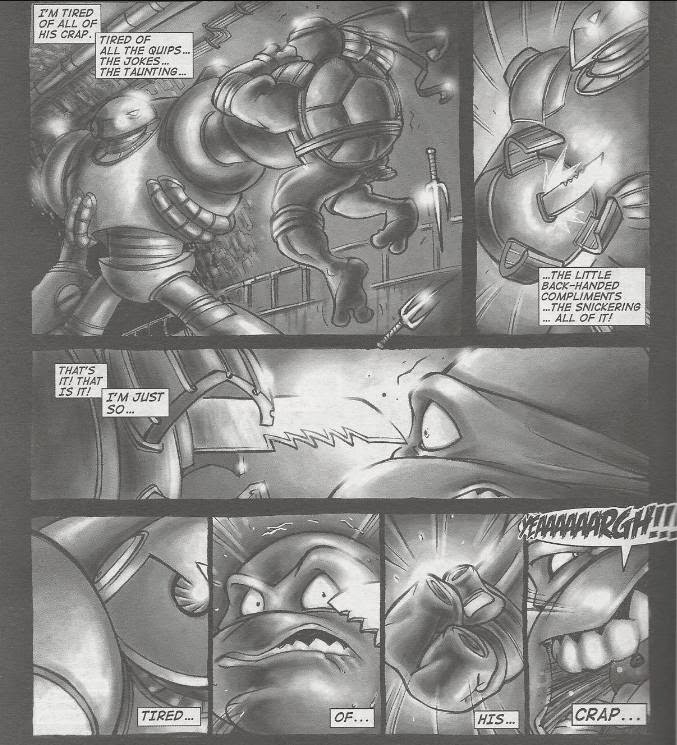 In his rage, he vows not to lend Mikey a hand next time they’re in combat and instead says he’ll stand to the side and laugh as Mikey begs for help. Suddenly, Michelangelo shows up and asks if Raph wants to come back to playing Halo. He says he’s sorry for making fun of Raph while they were playing; he was just kidding around. Raph, now totally calm and composed, tells Mikey it was no big deal and they head back to the lair. Mikey asks what the deal with the robot was and Raph just shrugs, saying he doesn’t know where their wacky adversaries come from half of the time. *There’s really no telling where in the TMNT timeline this story takes place; it could go just about anywhere. 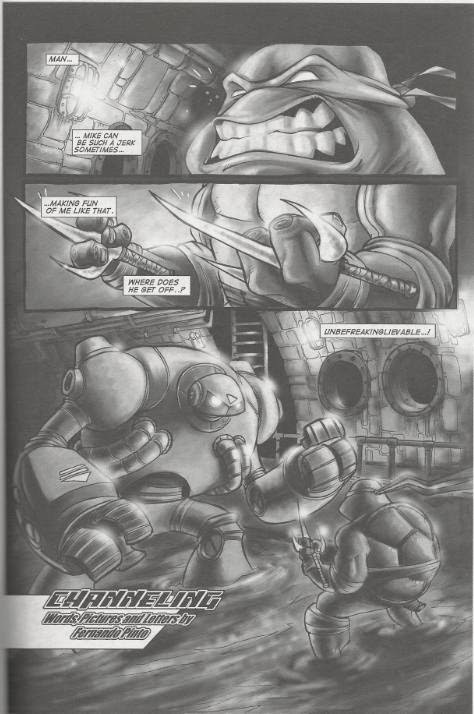 Personally, I like to place it just prior to Volume 4, as the random robot attacking the Turtles for no reason sort of complements the story in Tales of the TMNT (Vol. 2) #42. Likewise, Raph's line about having faced lots of foes and his improved ability at handling Mikey's annoyances point to it occurring further into their careers. 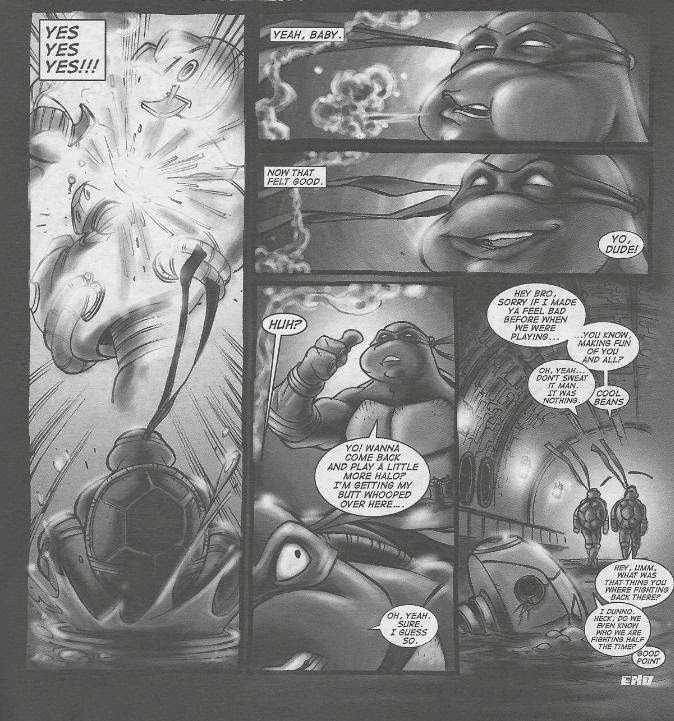 This vignette from Fernando Pinto is a nice character piece on the relationship between Raph and Mikey. It sort of calls back to the opening scene of Raphael (microseries) #1, where Raph gets so mad at Mikey’s teasing during a sparring match that he nearly brains him. It’s a reminder of how personally Raph takes Mikey’s taunting and how even though Raph is always picking on him, Mikey equally hurts his brother (if on a more emotional level). But there’s also a fake-out going on; that the “fight” Mikey was giving Raph a hard time during was just a video game and this is Raph’s way of letting off steam (or “channeling”, if you will). You can see how far Raph has come since the days of his micro; he no longer takes his frustrations with Michelangelo out on the Turtle, but finds other means of venting. It’s for that reason I like to stick it further down the Mirage timeline; it shows how much Raph has grown whilst still staying more or less the same guy. Pinto’s layouts are really good and there’s great use of perspective on all the action shots; characters are constantly moving toward or away from the reader with the proper use of foreshortening for dynamic emphasis. What I REALLY dug was his shading; a technique we were seeing less and less of in Tales of the TMNT. As a matter of fact, the main story it was paired with didn’t use shading or toning AT ALL and the two comics juxtapose very starkly against one another. “Channeling” is a pretty great vignette about two Turtles who used to be a family-within-the-family when the Mirage TMNT comic first began. That dynamic was sort of abandoned in the early stages of the brand, but stories like this act as a reminder that they’re still closer than perhaps any of the other Turtles. I'm guessing that was made by whoever made the Fugitoid robot. It looks like a pumped up version of him.